Wareaglescott's '79 SC build thread. Purchased a '79 SC in May and have been enjoying driving it and doing some small projects. The car has 172,000 miles and is a nice driver. Originally a brown car that has been repainted red. Based on where the red paint gets to and some of the components the paint is behind it looks to have been given a pretty good freshening up at some point. The records are minimal as they were misplaced at some point in the past a couple owners back. I purchased the car from another Pelican member that had it for about 5 years. My plan was to drive it over the summer and come up with a plan of attack. (I am in Alabama and working in the garage isn't that enjoyable in the heat) The car actually runs and drives quite nicely but I bought it to change it. Not a ton of automotive experience. Built a Factory Five Cobra kit with a Coyote crate motor. This is my first air cooled Porsche build. Always been a 911 fan. Also own a 2018 C2S. Have a ton to learn on this build and will rely on the fine people and knowledge here! The interior is black and in pretty nice condition. Can use some general freshening up. New seats - I am 6'3" (car has a sunroof) and find I am just not real comfortable in the stock seats. Looking for a seat option that I sit more into than on top of that I can bolt more directly to the floor in a fixed position possibly that will have the end result of a lower seated position with more comfort than what I have now. I am in a rural area with a very minimal car scene so I need to figure out a way to find some seats to sit in and try out. More research needed on this front. Seat belts - also colored to match the exterior accents. Depending on seats possibly a 4 or 5 point harness. Engine - I said I do not really need a fast car but I would like it to be faster than it currently is. Part of my reason for this project is to learn more. I plan to pull the engine and do some work on it. The scope of the work is to be determined. It still has the smog pump and AC functioning. The smog pump and its associated components will go for sure. The AC works great and I wold like to retain that. Aftermarket electrical AC systems seem to sound good but that is 5k to replace something that currently works fine as it is so I will have to evaluate that. Transmission - may or may not need work. This is really the only 915 transmission I have driven so hard to tell if it needs rebuilding or it is just how they are. Need to investigate that further. Front and rear suspension upgrades. Basically I plan to go through the entire car. Figured it would be a good time to start a thread so I could consolidate my information and have a place for feedback and to ask questions. I am very open to suggestions and help from all the knowledgable posters here so I welcome your input. The car is not original so I have no problem deviating from original spec and making it my own. I am sure they style will not appeal to everyone. It helps me to visualize my projects before I start and have sort of a goal in mind. Prior to starting the Cobra I had an artist draw up a rendering of the car with the various components I would use. I love blue Cobras with white stripes but I also love to have a unique looking build. 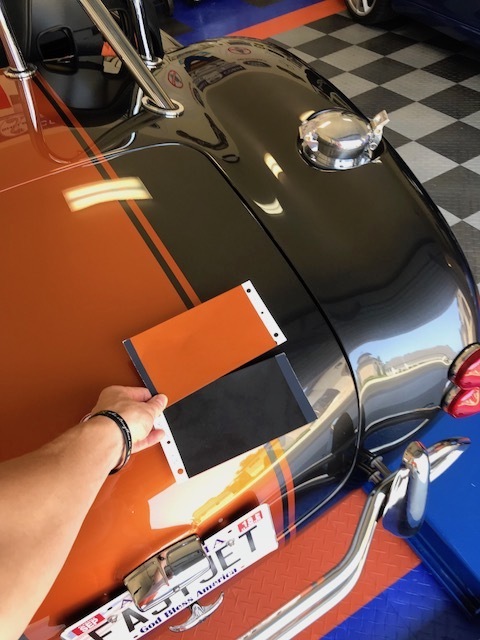 When I told my buddies I was going to go with a gray car with orange stripes they thought I was crazy. When they saw the rendering most thought it was pretty cool. When I finished the car and people saw it in person the response has been extremely positive. With that I have a very unique look and I take pride that mine does not look like most others. 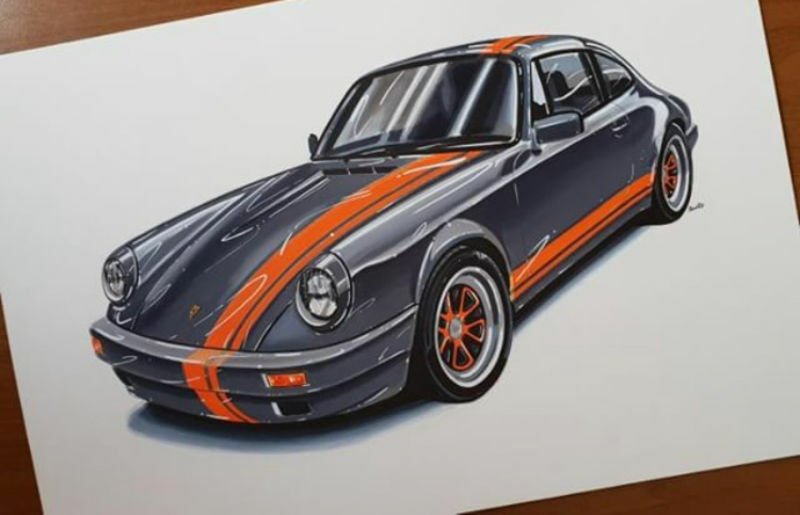 Keeping that in mind I thought about doing the 911 in a unique scheme and decided I love my colors so much I wanted to use them again. (well I am 95% sure on that. I may change the accent color but will for sure be using the base color). I had the same artist draw up a rendering with the bumpers, wheels, and paint. 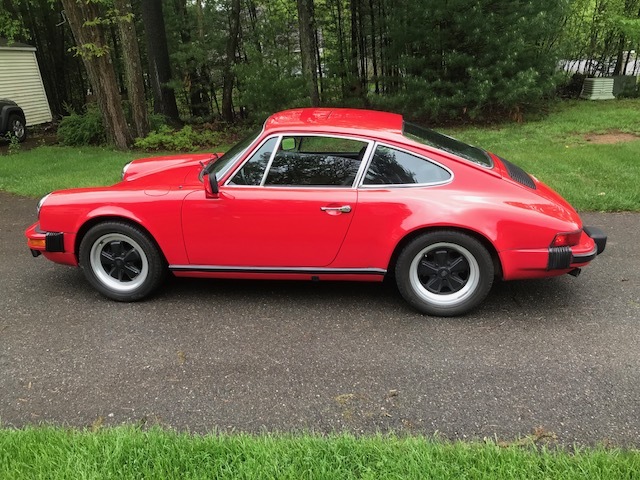 I am fully aware when it comes time to sell the car the look will turn off some buyers and probably hurt the value but I accept that going in and am fine with that. I build the cars the way I like them and whatever the end result/value is does not bother me. Thanks for reading. I appreciate any input. Who are you? I'm the Guy! Steve, thanks for the lead and inspiration on the wheels! Welcome - I’m looking forward to seeing this develop. You will have great fun (and some frustration, but it’s all character building). I’m still struggling with the ‘while I’m in there’ syndrome. Watch out as it can be catching! Had my local painter do some color samples. 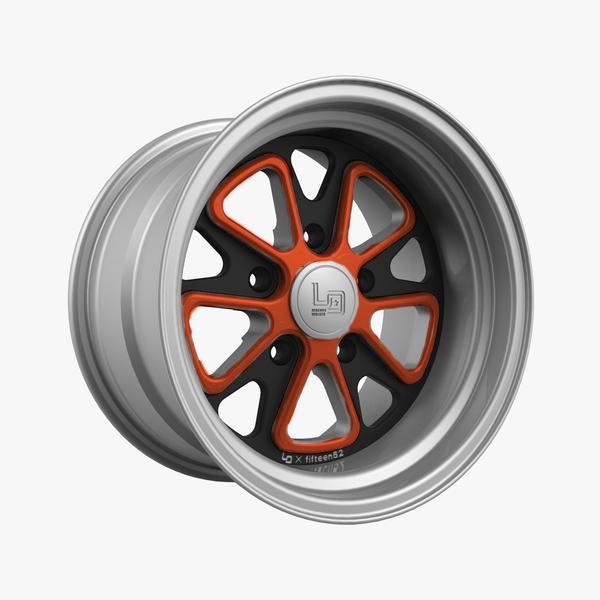 I am using the same color scheme as one of my other cars and also ordering the wheels with that same color code so I wanted to make sure it looked pretty much the same from one spray to another. Looks pretty darn close. I was to lazy to pull the Cobra out in the sun for a true color comparison but I think it should be close enough for sure. I have some extra time off work next month so I am preparing to pull the motor out and get to work on the mechanicals of it. Ordered an engine stand adapter. 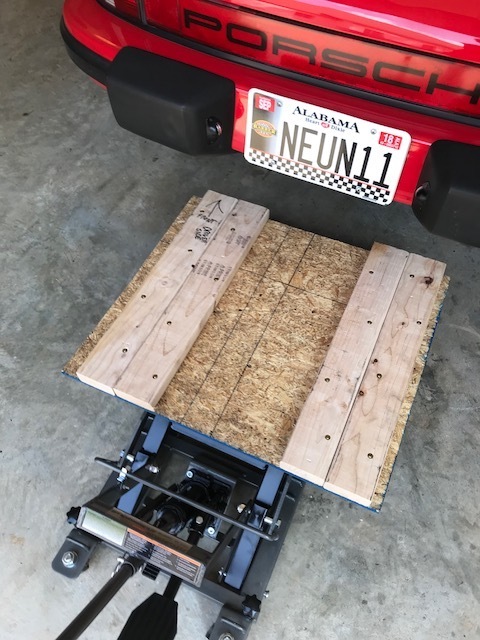 Got an ATV jack and built a platform to lower the motor onto. I am hoping with my 2 post lift and the jack with platform the physical part of lowering the motor should go smoothly. I mean gravity is on my side. What could possibly go wrong?! I already have the engine hoist to lift the motor up and into the engine stand. Love the Colors Scott, welcome! What equipment do you fly? Welcome. SCs are great cars and with a few tweaks they can be a fun and fairly quick car. If you don't already have Wayne's How to rebuild and Modify 911 Engines, you will find it has much information about possible upgrades. Welcome. SCs are great cars and will a few tweaks they can be a fun and fairly quick car. Got it and am currently reading it. Thanks for the suggestion though! 717A, great airplane pilots love it, currently a restored 1959 C-182 Sklylane straight tail. I'll enjoy seeing the progress here. LOl the colors have nothing to do with Auburn really but I do enjoy them. Ha - yes, now that I look more closely I see it is more gray than blue and the orange is definitely closer to the orange that other school in Austin uses. Though, I have to admit I think orange is a great color on these cars. My car is pretty much stock and I love the Petrol Blue color, so I always agonize over things that take it away from stock (though I see mine becoming a scoundrel if not an outlaw over time). I really like artist's rendering of what you're headed for and look forward to seeing it. Good luck! As in Boeing 717A? I googled 717A and it came up with a John Deere lawn tractor. 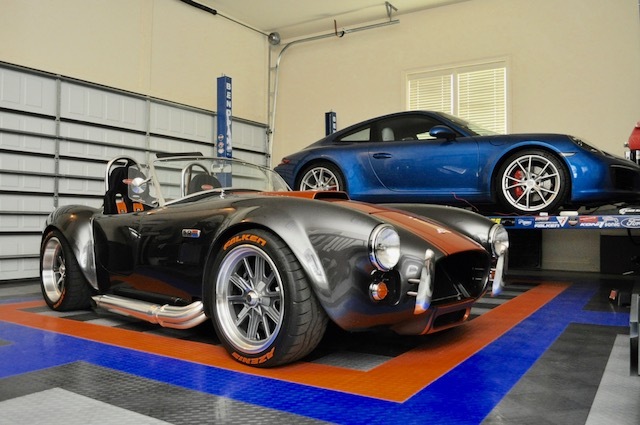 Cool looking build, and very cool garage/other toys. A is my position as in Captain. B signifies first officer. Since the guy asking used the term equipment and has flyboy in his name I figured he would get it. The aircraft is just 717. If you don’t like it just don’t click on it. That makes it easy for me to find vs some ambiguous 79 title that there are already multiple variations of. Welcome and I look forward to seeing the updates. I love the rendering! Well, except for the sugar scoops, but you said you were going to replace those so it works out. I think the color scheme with the 52's will look amazing. I like the offset stripes. The SCRS bumper is the prettiest impact bumper replacement option going. BTW your garage is super sanitary! Is there a Cobra build thread somewhere on another forum? Would love to check it out. They are really fun cars. There seem to be a ton of pilots that drive 911's. I know of 2 in our local group alone but I recall an off topic thread of pilots on here somewhere. The grey color on the cobra looks great, what is the color called?